Halloween, the fastest-growing holiday in the United States, has its origins in the Celtic world. In Ireland, it has long been known as Snap Apple Night, and many of its traditions, like bobbing for apples, have been brought to America over time. Thankfully, the goblins did not come over, too! One year on the Emerald Isle, as eleven t’ank Gods (children) get ready for the fun, their mother Maise Magee sets out to fetch water for the apple barrel. Three goblins spy Wise Woman Magee along the way and know that she could use her magic to help their sick friend Rua. Now, as everyone knows, goblins do not ask for what they want-they just take it. And once they have something (or someone), they hold on for as long as they can. What becomes of Maise Magee, her eleven t’ank Gods, and Rua and the other goblins is anybody’s guess. 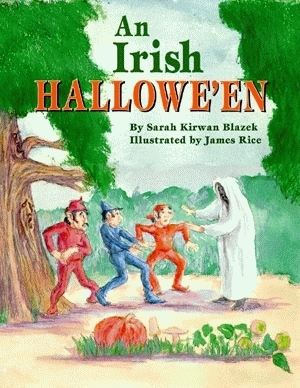 Anything can happen on An Irish Hallowe’en. Sarah Kirwan Blazek, born in County Wexford, Ireland, is now a teacher in Chicago, Illinois, and retains dual citizenship in both Ireland and the United States. She also is the author of An Irish Night Before Christmas and A Leprechaun’s St. Patrick’s Day, as well as the narrator of the companion audiocassette, which is a compilation of these two books. All are published by Pelican. Author/illustrator James Rice (1934-2004) produced sixty books, including the illustrations for Pelican’s treasured The Night Before Christmas Series. Mr. Rice’s first book, the well-loved classic Cajun Night Before Christmas, has more than 750,000 copies in print. With over 1.5 million copies of his books in print, Mr. Rice ranks among the nation’s best-selling creators of children’s books, receiving awards from Printer Industries of America and the Children’s Book Council.